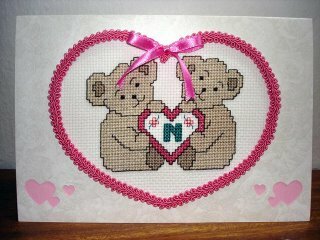 Look what I received for my Valentine Stitched Card Exchange (VCSE). A beautiful card from Lene in Sarawak. Thanx Lene! I love it. 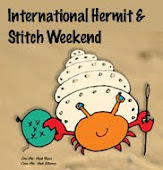 On top of that, she has also sent me some stitching goodies. As you can see in the picture, a lot of thought went into her gift. 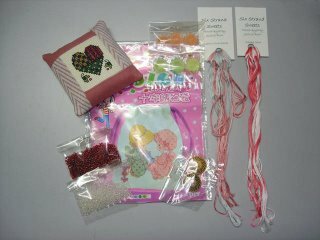 There's a mini tuck pillow that she has made, 2 packets of beads (one red and one white), 2 skeins of Six Strands Sweets, 3 types of different buttons and a cross stitch kit. I'm in heaven! 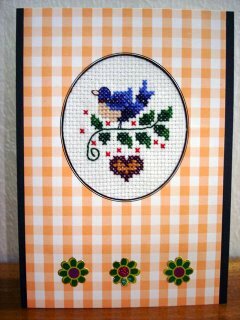 This exchange is organised by Nik from the Malaysian Stitchers group and is my very first exchange. There are 13 of us altogether and each of us has been assigned a secret partner which we have to send a Valentine Stitched Card with the option of additional gifts in the colour of love. My secret partner is Niesa and since she has received the card I sent her, I can show it to you now. I had a lot of fun with this exchange and hope to join many more in the near future. Happy to here that you love the card and the goodies I send to you. Hope to see you join more exchange in future, Vero. Congrats both of you on an excellance exchange. Love 'em all! !